Ever have a recipe that didn't want to be baked? When making the first batch, the day before these, I slipped. Dropped something into the oven that burst. 8 hours later after the oven was cleaned and we managed to use a Dremel to cut the lock off the Self Cleaning latch on the thing, I finally got it open. Fast forward to The Next Day. These two batches baked perfectly, the second one looked just like the first. 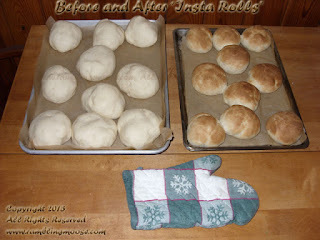 The rolls were 1/10th of the 1 1/2 pound batch of the Insta White bread recipe I have below. 2 1/2 pound recipe is at the bottom of the post and I got 18 out of it on the first day. It's actually a Bread Machine recipe, but if you have a dough hook and a mixer, toss the goodies in the order listed and let the thing knead until smooth. I usually make my bread in the bread machine on the knead cycle, then pull it out and bake at 450 for 11 minutes. Your bake time will vary. This recipe made for a very light and fluffy inside of the roll. Much softer than the usual recipes in fact. I had one of the rolls with a bit of Ham and Cheese for lunch and frankly it made the sandwiches better. The crust was bold and had a nice flavor to it which you don't usually get on a white bread recipe. I use the knead cycle on the bread machine, break the dough up into ten pieces, and allow to rise for more than 2 hours or until the size doubles. Personally, I think you will want to experiment with the amount of water in the dough. My flour here is a High Gluten bread flour, and it just wants more water. All purpose flours will give you a different result. So since Bread is a living thing (until you cook it) your results will vary.